J: I’m sorry. I didn’t mean to be sick. Me: It is okay. Just because you are sick it doesn’t mean I don’t love you. United Methodist friends, today is going to be rough. I didn’t sleep. Many of my friends didn’t sleep. We are tired, cranky, and a little bit tired of the arc of history being so long… I heard a speech on the livestream of General Conference yesterday about hearing the same arguments over and over… I sympathize. I am also very stubborn! Young friends, we are birthing something new. If you have never raised a child, I will tell you that it takes a lot of patience. I cannot tell you how many times YESTERDAY I asked a toddler to stop pulling leaves off of the houseplant… Being a parent takes patience. Older friends, do not be deceived. Something isn’t wrong just because our younger family in Christ is trying to do something new. To be honest, we have likely had siblings trying to help us through this struggle for decades. I know that is a truth for me. Beloved family in Christ who are my age, we likely have decades to go before our time is done. We are the ones who can shepherd and support the generation after us. I can think of folks who shepherd and shepherded me along this path. Don’t give up. You stand up tall and you speak loud. To those who gather and stand proud. Others sit silent in the crowd. A prayer from a Gentile who was welcomed to Christ’s table thanks to the work of the apostles. I have a chance to lead and be a part of the church thanks to their efforts. I have a voice thanks to their efforts. How I use that voice matters. Put up to a legal vote. A picture drawn by my daughter. Hear the deep sound of how my heart does pound. Listen to the call of Your servant child. To those who seek You in these times so wild. Our community through this way forward. Guide our ships from seas of chaos: shoreward. As we trust Your Spirit to guide us all. And be with all those whose faith may shrink small. The way we seek by the light of Your Son. When all is done may we who pray be one. If poetry does reflect and express the poet’s faith and commitment, then perhaps there is a sense at which heartfelt poetry is prayer. One of my greatest challenges with liturgy is the struggle to include the word “Amen” after every prayer. For a long time, hymns concluded with an amen. Nowadays, it seems as if almost every prayer needs and “Amen” in order to conclude. Amen has a rich history and depth of meaning. The usage of the word for the congregation to enter into the depth of the prayer is helpful. When we say amen after someone prays, we become a part of that prayer orally. It is a wonderful act of inclusion in an act of worship, but often folks seem to believe that any prayer must have an amen. This is not true. I thought I’d share a poem I recently wrote in an attitude of prayer after a saint invited me over to lunch. I wrote it for a thank you note, but I thought it was a perfect way of expressing how a prayer can be found in poetry. Scents waft up from a warm bowl of chili rich yet faint. As I sit to share a meal with an elder saint. And we break bread together with prayer. Is filled with a depth you can feel. As my inner cares cease. The form itself was fairly simple. I started with thirteen syllables a line and decreased a syllable each consecutive line. The rhyming pattern is a set of 5 couplets with a rhyming envoi creating one tercet at the end. It is clearly a poem. It is also clearly a prayer. I intended to express care, gratitude, and thankfulness for the opportunity. Although God is not addressed by name, there is homage paid to communion in the mentioning of the breaking of the bread. The person I shared a meal with is a saint, there’s a stillness while listening that ties back to the idea of silence in contemplation and prayer. Even the mentioning of saints can draw our thoughts to God. Psalm 19:14 says “Let the words of my mouth and the meditation of my heart be acceptable to you, O Lord, my rock and my redeemer.” It is my belief that poetry that seeks to live into this verse really is prayer. I write this blog post for posting a few days before the beginning of the special session of the General Conference of the United Methodist Church. I write this blog with a lot of questions in my mind. What will happen over the next few days? What effects will that gathering have on the church as a whole? My questions about the future have been inspiring questions in my mind. What does it mean that we are a “United” Methodist Church? What does it mean that we have deep divisions in our unity? Have we missed something? Dietrich Bonhoeffer, “Life Together,” page 4. Bonhoeffer writes this quote in the midst of contemplating how rare it is for Christians to live in community. As Bonhoeffer points out, Jesus himself lived a life that involved isolation during many of the major events of his life. Jesus was alone even in the midst of the crowd for many events of what we call the “passion.” Bonhoeffer points out the lonely lives lived by many of the apostles, missionaries, and even individual Christians throughout the centuries. Reading Bonhoeffer is always challenging, but these words were particularly biting in light of the upcoming events in the life of my denomination. Have we honestly thanked God that we have each other? Have we thanked God for the privilege of living in community with one another? Have we seen our living together as anything but a gift of unmerited favor? Honestly, when I see some of the vitriol in the community of faith I share with other Christians I do not always see people thankful for grace. I have seen people stand there and say “You do not belong in the church” when they are only in the church by the grace of God. They have been given the blessing of belonging to a body of faith. They have been given a grace and it seems as if that grace is taken for granted. How many Christians over the centuries longed for a place to belong with other Christians? How many of our churches exist because people came together to have a place to belong? Are we turning our back on that legacy of grace? Are we so thirsty for law, structure, and power that we would burn our community of grace to the ground if we do not get our own way? It is far easier to tear down than to build something. It is far easier to destroy than to give life. As we head into General Conference, I am praying we remember that we are only together by the grace of God. I am praying that grace prevails. Who are left out cold. This week I am attending the second last session of the Academy for Spiritual Formation. One of the things I have found at the Academy is a community of souls who are diverse and beautiful. There are also several folks who love awful jokes. So, while I did pre-write these posts, I thought I would share a joke that I have been working on for other folks who love bad jokes. It is a twist on a joke out of a book my kids gave me. Two friends lived their entire lives next door to each other. Their families spent time together, their kids played together, and they were really great neighbors. Every year they would go hunting for water fowl and the friends would sit together for hours. Over time one of the friends began to be bothered. It seemed like everything in life was grand, but his friend always found a way to look at the downside of things. If there was a rainbow, he’d complain about the rain. If there was a bumper crop of zucchini, he’d complain about eating the same thing every night. If he went hunting and did not reach his limit, he would complain about bad luck despite having birds to clean and feed his family. This man loved his friend, but it was increasingly difficult to find a sense of humor about his friend’s tendency to complain. He became obsessed with pointing out the little blessings, but his friend seemed oblivious. After a few years of this, his long patient and helpful hunting dog passed away. Sure enough, his neighbor started complaining about how tough it was to train a new dog. He loved the pup and started his training. He was shocked to find that when he began to train the dog to retrieve fowl the dog would walk on water to the bird to retrieve it. It was a miracle! He was shocked, awed, and finally thrilled that he at last had a chance to show his friend that not everything was bad in this life. There were miracles all around if we stop focusing on the terrible stuff all the time. So, one day the two men go hunting. The man doesn’t tell a soul about his dog’s gift. Soon enough, the bird dog was sent to go get a downed fowl. The dog got out of the boat, walked over the pond, picked up the bird, and came back. Our dogs Lily and Wolf. They approve of this joke. Praise God with loud drum. Praise God with low hum. Praise God with rocking guitars. Praise God with your voice. Praise God with your choice. Praise God beneath all the stars. Breathe deep as you strum. Breathe and let soul thrum. Breathe deep and cry with your heart. Breathe deep and be kind. Breathe, rise, and make a fresh start. Today’s poem was inspired by Psalm 150. We’ll be reading the psalm this Sunday in church. I wrote it in the “Alouette” poetry form. I tied together the two stanzas by rhyming the first two lines in each stanza. My process was to envision the first stanza as a response to God’s Presence (which echoes powerfully in Psalm 150) and the second stanza as the body breathing in preparation of living with that Presence in the world. And was taught deep faith. I don’t recognize all this. I lament what I now see. You remember the good things. As people work through this life. And we saw through the curtain? Those days were hard days. Where martyrs may yet come forth. What should we do then? When all may be asked of us? At the feet of my Lover. And in cold dark Roman cells. Come near to the fire. But you will always be loved. I wrote this prayer poem in a conversation between my soul and God. The bold parts are a personification of the church. I was reminded in that time of prayer that nothing in the church was ever perfect. We cannot go back. The only way is forward. Tomorrow we are looking at Isaiah 45:9-13,15-19 at our church service. We will be focusing on the call of the community to live with a purpose, but as usual, church is only so long and there is more in the passage that is worthy of our time. In particular, I wanted to take a moment to look at the last two verses. In the NRSV, the Isaiah 45:18-19 calls out for attention given our world’s modern challenges. I am the Lord, and there is no other. I declare what is right. God does not create the world to be a jumble of chaos in the scriptures. God created a world that was meant and is meant to be inhabited. The world is very carefully crafted. Indeed, we live in a beautiful world filled with majestic creatures. To be blunt, a lot of those beautiful creatures are going extinct and huge swaths of the earth are struggling to cope with human induced climate change. For the entirety of our existence, humans have had an impact on the world. We systematically hunted certain animals to extinction over the course of our existence. Now our behaviors are bringing extinction to creatures not through the use of a bullet or arrow but by changing the chemicals in streams, filling oceans with plastic, and removing habitats through intentional deforestation. To me, this is an outrage and an offense to both the gift we have been granted and the world which we received. This world was meant to be inhabited just as the hotel has rooms that are meant to be rented. We are invited to this world like someone invited to stay at a friend’s house for a season. If we were to treat a hotel room like we have treated our world, we would be charged to repair the damage. If we were to destroy our friend’s house, we would likely lose that friendship. Why is the way we treat this world seen differently? I would invite you to consider whether we are called to treat our world better. More information about climate challenges can be found here. Have you ever stopped to wonder whether life would be different if we paid closer attention to the world? Would life be different if we focused on other matters than those that preoccupy us? If you are unfamiliar with Bonhoeffer’s story, Bonhoeffer was arrested for taking very public stances against the Nazi regime in Germany and for engaging in espionage. He was executed for his crimes during the last days of hostilities in 1945. 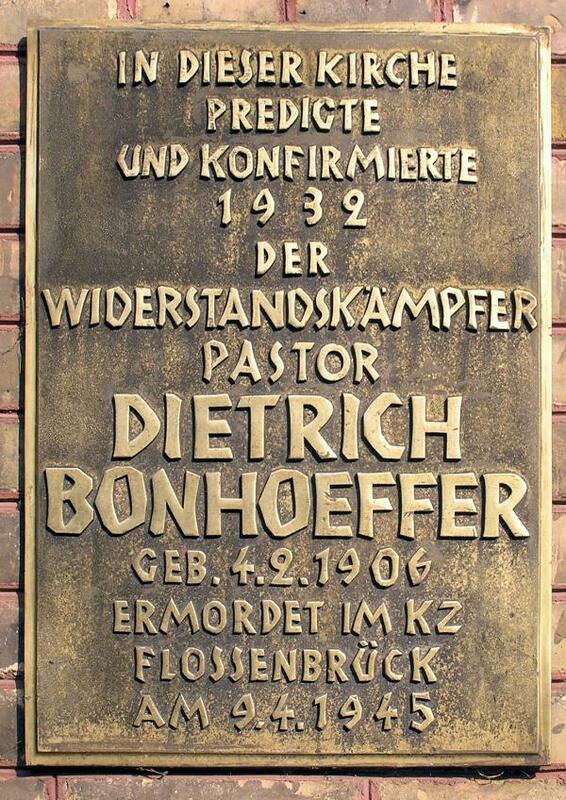 Bonhoeffer was one of the most prominent Lutheran martyrs of the 20th century. Bonhoeffer is writing to his father at the beginning of his imprisonment in the letter I was reading. They had separated Bonhoeffer from family, from his fiancee, and from his community of faith within the confessional church. Bonhoeffer was facing charges which could easily lead to his execution. What catches my eye is that Bonhoeffer notices the thrush in the prison yard. He could have obsessed over his imprisonment and isolation. He could have focused on being confined in his cell for long hours at night or being neglected simple things like shoelaces and shaving cream. In the midst of everything, Bonhoeffer notices the thrush. I am not imprisoned in my home. I have access to the world around me and my children are a regular part of my life. There are so many things I could focus on in life. I could notice the sound of my daughter singing to herself, the blessing of having a partner who helps me to be a better person, or a million and one other things. Instead I find myself focusing on matters that are not helpful. Do I have opinions about politics? Yes, I most certainly have opinions. Do I have an obligation to speak out against abuses? Yes, I most certainly have times when I must take a stand. There are many things I could focus on in this moment. We all have only so many days in this world. What do we notice as we spend our time under the sun? I pray that my calling in the world will come with the awareness that Bonhoeffer seemed to possess. Will I miss the thrush? I pray that I do not miss the thrush in my life today. May I gain blessings through all the little things. I wanted to post a post for Valentine’s Day that is a reminder that love has never been an easy thing to handle. Stalwart figures from church history faced challenges when it came to issues of love. The Desert Abbas and Ammas genuinely discouraged romantic entanglements. Some of them even refused to talk with folks that might lead to even the risk of their being attracted romantically. The monastic movement generally promoted and engaged in celibacy. There were exceptions and times when individual monks went astray from their vows, but most monastics certainly faced a challenging life. Martin Luther started a whole reformation movement without the support of a life partner until he married an escaped nun named Katherine von Bora. He literally snuck her out of a convent in a fish barrel. Generally every relationship with a woman in John Wesley’s life ended poorly. Lots of people struggled with romance and romantic desires through the history of the church. If you are alone today, it is good to know that you are in good company. I would invite you to know that you have worth outside of a romantic relationship, that you are a beloved child of God, and that the fourteenth of February really is just another day. I pray that your day goes a lot more smoothly than John Wesley’s day once did. Also, if people really don’t like you and may shoot you, don’t go alone to their house. That’s always a bad choice. In need of kind and warm grace. Are you called to act? Is often broken by love. Today we awoke to a house surrounded by ice. Ice is a wonderful gift in the middle of a hot summer day in a cold drink. In the middle of winter, ice can often be a challenge more than a slight inconvenience. For the past few hours I have been working at deicing the church parking lot in anticipation of upcoming events at the church. I have made little headway and our local radio station is predicting further ice tonight. While broadcasting salt across the ice this morning I thought back to the times in my life when I worked with the homeless, especially during my college years. I thought about the challenges faced by folks who want to the right thing to help someone, but do not know what to do. If you give someone money, will it be used wisely? If you give them a flashlight, will they trade it for something else? One of the first lessons I learned is that you cannot control what others do. If you bless someone with a flashlight, they might trade it for something else. If you offer them a blanket, they might exchange it for a drink of something untoward. You cannot control what other people do, but that does not mean that there are not concrete things you can do to help others. Keep a blanket blessing in your trunk. I suggest a warm blanket that is not large or bulky. Roll that blanket up with two pairs of new thick, warm socks, a knit cap, and a pair of gloves. The time to make these blessing blankets is not now. If you wait until end of season sales, stock up on the gloves, hats, and winter socks when they’re on clearance. Set a limit to what you want to do next winter (e.g., one set, five sets, ten sets) and store them with your winter snow brush. Put them in your trunk when you put your snow brush back in your car next fall. Offer to buy someone a meal instead of giving them money. If they are hungry, ask them if you can buy them something to eat and then follow through. If you do not have time to sit with them, offer to bring them drive-thru or takeout. Offer to get them a hot drink with the food. The heat goes a long way. Note: Some people will say no to your offer or try and convince you to just give them the money. Use your best judgment, but I would suggest you offer the food and hot drink. Instead of offering people money, buy a box of those chemical hand warmers at the end of the season. Offer them to people who are out in the cold. It is a simple gift. As a caution, check the expiration date if you’re buying for the next season. Unlike the blanket blessing, they expire. If you live in a semi-rural location or in a location with more local businesses than chain restaurants, talk with a local restauranteur. Ask if you can buy a certificate for a “meal” complete with warm drink, food, and the tip included. If you talk with a small business owner and explain what you are doing, they may help you out. This may be something that ends up being traded, but if you are concerned it is still better than giving money. I laugh. The gummy bear flew. I wrote this senryu to play a little bit with the “Games Night” theme at the dVerse Poets’ Pub. I have played enough video games to realize that it is sometimes fun to pretend not to know anything about them. This poem is inspired by a twenty six pound Gummy Bear that you can actually buy. Who needs chocolates for Valentine’s Day? Seriously though, you could kill someone with that thing. I imagine it’ll make an appearance in a Dead Rising game at some point if it hasn’t already. By the way, this is my 200th blog post! I have others scheduled for the next few days, but I wanted to say thank you to everyone who keeps encouraging me by reading and enjoying my posts, even when they’re silly. Blessings to you. This week in church we’re looking at Jeremiah 18:1-6 with our children during worship. In the passage, Jeremiah is called to walk down to a potter’s house to observe the potter at work. With our children we will talk about how God can work in our lives. Clay itself can be nasty stuff when you dig a shovel into a yard and find the dense stuff below a thin layer of topsoil. It can be challenging work to move enough of the stuff to plant even the smallest of tree bulbs. Clay is difficult stuff; however, in the hands of a master potter clay can be wonderful for creating beautiful things. We will tell our kids they are being made into beautiful creations. Call it naive hope or call it prophecy, I believe each of the kids in our church have a bright future ahead of them as awesome people. The challenge is that there’s a second side to this story. Jeremiah is a prophet called to a place that needs prophetic work done in their lives. The clay needs to be reworked in Israel. As their potter, God claims the right to rework what has been done. I wrote the rondelet above to look at this reality. I wanted to lean into the concept of being clay. We work hard at building lives in this world and it can be difficult to trust even God to rework the clay of our lives when we become comfortable with the way things are in our lives. We sometimes need to be reworked. We need to work that living water into our lives, to be flexible, and to even be fired in the oven. We might be tempted to look at this reworking as punishment, especially if we are comfortable. Sometimes, we will put up with a lot of cracks and chips to stay comfortable. Some of us would do anything to just be left alone. The attitude that says “Just leave me be” does not necessarily help us. If I have a broken arm that has set poorly, it may need to be broken and set again. If I have a heart valve that is leaking, I may need to see my cardiologist if I want to live a longer life. When sick we need a doctor. When cracked, we may need to see our Potter. This reworking is not necessarily pleasant. If you are struggling through a remaking, I want you to know that you are neither the first nor the last to face a challenge in your life of faith. You are more than likely surrounded by people who have faced their own challenges. You are not alone. Yesterday I preached a sermon on why God allows evil in the world. The sermon was hard to preach. Yesterday, we were blessed with a guest who shared a longer testimony than we’re used to in church while my watch buzzed at me to wrap up. Patience is difficult for me. Yesterday, I attended a fundraiser for a friend whose family is struggling with illness in a small child. I just want to make everything right. Today there is no poetry in my heart. Today there are no deep reflections. Today I need rest. I will try and post something meaningful tomorrow. While you wait, I invite you to ponder how you know when your soul and body needs a moment of silence. To keep the frost from my bones during winter’s wonder. To be as warm and cozy as once gift wrapped sweater. This ugly sweater that they once gave me years ago. But that warmth fills my heart. I can take both kinds to go. Me out of your mind with coarse fashionista’s glove. I do not wear this as a fashion faux-pas blunder. I wear it because it warms me with both wool and love. I wrote this poem for the dVerse poetry form rubaiyat challenge. We were invited to reflect on our writing process. I was thinking about the prompt offered by Frank Hubeny in the comment of “vortex.” I did not want to go straight into the vortex as I somewhat covered my feelings on the polar vortex with my blogs on “Ice” and the angry poem about that groundhog. I started to think about the polar vortex and the cold that filled our home despite our best efforts last week. I thought about how nice it was to be warm, but that most forms of being warm were transient. Despite the subzero temperatures, the sweaters I wore did keep me warm wherever I went. I didn’t look very fashionable, but I was warm. So, in many ways this was an ode to both those awful Christmas sweaters and to the kids who made sure I had warm clothes to wear. I enjoyed writing it even as it wandered around from one quatrain to the next. I guess, in a sense I am grateful for the kids, the sweaters, and for the prompt for happy contemplation. They bud with spring heat. What if you’re amazing too? How did you not see shadow??? This senryu was written while waiting for a chance to grab lunch. Hunger has an effect on my sense of humor. It was written in response to Frank Tasson’s Haikai Challenge. The challenge responded to being cold and was presented on the day when the famous shadow forecasting of a particularly coddled groundhog on February 2nd said it would be warm soon. I obviously went with the senryu form, which is obviously not to be taken as a personal insult to the people of Punxsutawney. This past weekend I was challenged with a question. The question revolved around my vision of ministry. What evolved from the question was the realization that I am often not clear about my own particular vision for ministry. What do I seek to embody in my ministry? Could I express my vision for ministry in the time it takes to ride an elevator? I have been thinking consistently about that question since it came into my mind. I have been asking myself how to express my view of ministry. Side questions arose from this contemplation. Could others remember it? Could they see it in my actions? Do I have a phrase that helps me stay focused on my purposes? What’s the phrase? “I believe that the church should seek to be ONE.” I want my vision to be Open, Nurturing, and Empowering. Let me break those buzzwords down into something more succinct. Buzzwords are nice but they do not always serve the purposes which they need to serve for others. These lists are meant to be examples and not a complete or restrictive compilation of ideas. I believe the church should be Open to new people, Open to new expressions, Open to people who are differently abled, Open to hear/converse with our neighbors, Open to taking God’s love out of the church building, and Open to hear God’s voice. I believe the church should be Nurturing to people who want to know God more, Nurturing to those who have had few advantages and many obstacles, Nurturing to those who are wounded or in need, and Nurturing with/towards other communities and people in our neighborhood. I believe the church should be Empowering to people who need God’s freedom in their daily life, Empowering to those who have been oppressed, Empowering to folks who believe their voice does not matter, Empowering to those who need to borrow our strength to break free from their shackles, and Empowering to people who want to seek to enter into life changing discipleship. Seven years ago, I knelt before my Conference and was ordained into ministry because people were Open to my leadership, Nurtured my potential, and Empowered me to go forth in ministry. What kind of person would I be if I did not seek to do the same for others? You cannot be truly Open to the community if your building or community has significant barriers for differently abled folks. You cannot be truly Open to the community if you don’t welcome folks who are different than you in culture, race, ethnicity, or viewpoint. You cannot be fully Nurturing to the community if you immediately dismiss people when they find the courage to talk about real life problems that make you feel uncomfortable. You cannot be wholly Empowering if you look down your nose at folks who haven’t had the same advantages as you. You cannot be wholly Empowering of other people’s ministries within the church if you rely on authority for leadership in the church instead of relationship, vision, and calling. What are the words of the communion liturgy? Because there is ONE loaf, we who are many are ONE body. May we all be ONE in the love and care of Jesus.